According to legend this rock is the remains of the 'Hag of Beara', staring out to sea awaiting her husband, Manannán mac Lir, God of the Sea, to return to her. The Cailleach Béara is also known as the Hag of Béara, ‘Cailleach’ being the Gaelic word for a hag or old crone. One of the oldest and most powerful of mythical beings associated with Ireland, the Cailleach forms part of the Great Goddess trinity, alongside younger incarnations as the maiden and the mother. Some also believe she is the second side or winter half of Bridgit, another extremely powerful Irish goddess. The Cailleach myth is most closely associated with counties of Kerry and Cork, with the Book of Lecan (c.1400AD) claiming that the Cailleach Béara was the chief goddess of the Corcu Duibne people of Kerry. The Hag of Béara is said to be one of the most ancient of mythological beings. Appearing as an old crone who brings winter with her when she appears and who wields incredible power over life and death. Her ability to control the weather and the seasons meant many communities looked on the Cailleach with a mixture of reverence and fear. They were concerned that her mood might affect the productivity of their winter crops. She is also said to be responsible for the formation of many of the country’s most prominent mountain landmarks, including, Hag’s Head on the Cliffs of Moher in County Clare and Sliabh na Caillí, ‘The Hag’s Mountain’, in County Meath. According to legend, she either dropped or threw stones from her apron as she passed through the land and these grew into rock formations or mountains. The Cailleach is, therefore, often attached to sites of geographical and geological significance across Ireland. Her name, Boí, gave rise to the name Oileán Baoi, Dursey Island, located at the tip of the Beara peninsula, which was said to be her home. A large rock situated at Coulagh Bay, close to Eyeries in County Cork, is believed to represent the Cailleach’s face which turned to stone as she stared out to sea, waiting in vain for her husband, Manannan mac Lir, to return to her. Even today, people visiting the site often leave coins, trinkets and other offerings to appease the Cailleach. Local folklore states that An Cailleach considered the arrival of Saint St. Caithighearn, who preached Christianity in Kilcatherine and the surrounding districts as a threat to her powers. One day, after gathering food the hag returned to Kilcatherine to find the saint asleep. She approached the Saint quietly, grabbed her prayer book, and ran off. A cripple who lived nearby saw what happened and shouted at Saint St. Caithighearn, who woke up and saw the hag running off. The saint ran after her, caught up with her in Ard na Caillí, recovered her prayer book and turned her to stone with her back to the hill and her face to the sea. There she remains to the present day. Although most often presented as a mysteriously veiled, ancient woman, the Cailleach is also said to take on the guise of many different beasts and birds as she travels around the rugged landscapes of her homeland. She is also closely linked to various species of animal, sharing a particular affinity with the deer she safeguards, but also to wolves, black cats and wild cattle and goats. The Cailleach is a seasonal spirit and is sometimes referred to as the ‘Queen of Winter’. As the second side to the goddess Bridgit, she is said to rule the months between Samhain (the first day of winter marked on November 1st) and Bealtaine (the 1st of May and the first day of summer), while Bridgit rules over the summer months. In some versions of the tale, the Cailleach is turned into a boulder on the last day of winter and waits out the warmer months in this form before transforming back into her human shape on Samhain. The stone she becomes is said to remain moist despite the warmth of the summer months, because of the life force it contains. Various myths and legends surround the figure of the Cailleach. She was sometimes also referred to as the ‘Daughter of the Sun’ and became more powerful, youthful and beautiful as the days shortened towards winter and the sun became weaker. Towards the spring she loses her strength, finally being overthrown on the Spring Equinox, ancient New Year’s Day. In Scottish folklore, she is the other side to the goddess Bride, whose feast day is marked on February 1st, when the light is said to return. The evening before, the Cailleach is believed to visit the hidden Well of Youth and drink from it as the sun rises, so that she is transformed into the young, beautiful Bride. In other versions of the legend, February 1st – St Bridgit’s Day or Lá Fhéile Bríde – is the day when the Cailleach gathers the firewood which will see her out for the rest of the season. If the weather is good and she can collect plenty of tinder, then the winter will be a long one, but if the weather is bad, then she cannot leave her home and the cold season will soon end. Often linked to deer, one popular story about the Cailleach describes her encounter with two young huntsmen. After the crone who appears to them has pointed them in the direction of the best hunting ground, the two young men manage to kill an immense stag which they laboriously drag home to their father. Having reached their cottage, they find that the stag has disappeared, and they are scolded by the old man for not having blessed the meat as the Cailleach had instructed, meaning it could be taken by the fairies. The Cailleach is celebrated on various feast days, depending on which part of the country you are in. Different places will also have their own customs when it comes to marking these feast days, but most will involve some form of weather divination to calculate how long the winter will last. Scotland and Ireland both mark St Bridgit’s Day on 1st February, the day the Cailleach is supposed to transfer her power to Bridgit, who will bring the spring and summer months. If the weather on this day is favourable, then this is taken as a bad omen, as it means the Cailleach is able to collect extra firewood and draw the winter out, but if the weather is bad, she’ll remain asleep and the winter will be shortened. Scotland might also mark Latha na Cailliche (the Day of the Old Woman) on March 25th, a celebration of the transition from winter into summer. Until the 17th century, this was New Year’s Day in Scotland, and competitions were often held to see who could drive the winter hag away. Bealtaine is the last festival in the calendar and is marked on the 1st May. On the Isle of Man, May 1st celebrations involved staged battles between summer and winter, with summer always triumphing. The Cailleach features in various incarnations across the whole of Europe, with the figure of the old woman who brings winter a regular feature of European folklore and mythology. In Spain, for instance, there is the legend of the old woman who appears on the Feast of St Agatha on February 5th and takes winter away in a sack she carries. ‘Mise Éire’, as it’s commonly known, is an Irish-language poem by the Republican leader Padraig Pearse, written in 1912. Literally translated as ‘I am Ireland’, the personified Ireland laments her shame, pain and sorrow and describes how a country older and ‘lonelier than the Hag of Béara’ has been ‘sold’ by her children. Mná na hÉireann, or ‘Women of Ireland’, is an eighteenth-century poem by Peadar Ó’Doirnín, which has been made most famous as a song set to music by Seán Ó’Riada. Most closely associated with the poet’s home province of Ulster, the poem belongs to the ‘aisling’ genre and casts the region and country as a beautiful woman suffering terrible oppression. The poem and song have often been linked to the Cailleach legend, because of the shared fertility, power and strength which both the women of Ireland and the Cailleach share, and the belief that despite their suffering, they will be the salvation of the country. An intensely patriotic verse, it was usually classed as traditional ‘Irish rebel’ music but has been popularised in more recent times by artists such as Kate Bush and Sinéad O’Connor. This is one of the oldest examples of Irish poetry. Written in the tenth century, the poem is narrated by the Cailleach herself and is a lament for her lost youth as she decides to take the veil. Over the course of the poem, she describes the grief and loneliness she feels as an old woman, her sadness that the days of putting her arms around ‘comely youths’ and kings are over and her struggles to recognise anything of the world she remembers from her younger days. The Cailleach who is reputed to have lived seven times over before she was turned to stone, seeing multiple husbands and children die across the course of her lifetimes. The Cailleach Béara or Hag of Béara still holds a place in modern Ireland. 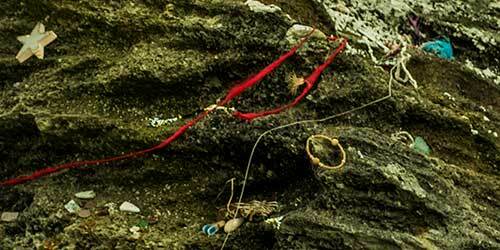 Countless people visit sites such as Coulagh Bay and leave offerings to the rock which is said to represent the old crone looking out to sea. Some of the many offerings left by visitors to An Chailleach Bhéara. Her inclusion in various well-loved songs and poems means the Hag of Béara remains one of the most important figures in Irish mythology, and the image of the old crone ushering in the harsh winter months is a powerful one. For all her power and the fear she once elicited, the Cailleach Béara remains one of the most haunting and poignantly sad figures of Irish tradition. 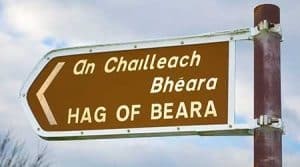 The signpost by the roadside showing the location of the Hag of Beara. Travel south along the Beara Way Cycle Route, the Coast Road, from Ardgroom towards Eyeries. 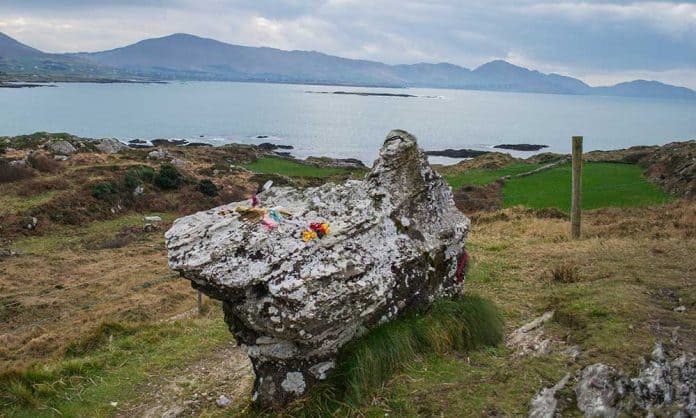 The Cailleach Béara/’Hag of Beara’ is located a short distance after you pass Kilcatherine Church and is on the right hand side overlooking Coulagh Bay. Although it is well signposted, it is still easy to miss. Roadside parking is available.